On this date in our family history . . . the 13th day of November . 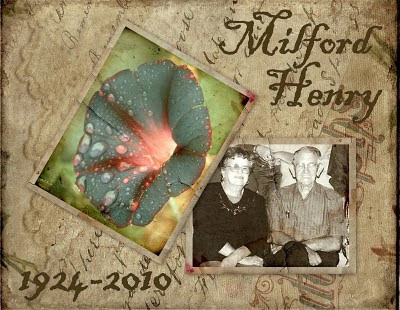 . . in the year 2010 . . . Milford Barton Henry was laid to rest at the Forest Grove Cemetery in Milam County, Texas. Milford was my 1st cousin once removed, and was born 14th June 1924 in Norton, Runnels County, Texas to Milton E. Henry (1902-1975) and Edna Gladys Henry nee Caswell (1902-1973). They left Norton around 1939, and Milford had made his home in Rockdale, Milam County, Texas since that time. He was a 1942 graduate of Rockdale High School. On June 2, 1946, he and Dorris Spence were married in Rockdale. To this union two children were born. Milford worked as a Shop Foreman with Texas Utilities. He retired from I.G.C. after 30+ years. He was a Veteran of World War II serving in the U.S. Army Air Corps. He was a founder and charter member of Rockdale Christian Church where he was a former board member and Elder Emeritus. Milford passed away Wednesday, November 10, 2010 at his home with his family. The date of his passing was the anniversary of the birth of his paternal grandma, Berta Mary Henry nee Sharp (1873-1955) . . . and it was also Forget-Me-Not Day. Milford had reached the age of 86, and was preceded in death by his parents and two adult brothers, Marlyn Edward Henry (1930-1995) and Charles Eugene Henry (1940-1973) as well as three infant siblings.